Nilima Bhat is co-author of ‘Shakti Leadership - Embracing Feminine & Masculine Power in Business’, with Raj Sisodia (best-selling co-author of ‘Conscious Capitalism’) and ‘My Cancer is Me – The Journey from Illness to Wholeness’, with Vijay Bhat. As the founder-director of Roots & Wings, a Leadership Consultancy and Sampurnah, The Wholeness Practice, she facilitates personal transformation, gender reconciliation and diversity and inclusion in the workplace. She has 30 years of global corporate experience and consciousness-based health and growth training. She has lived in Germany, Singapore, UK and Hong Kong and has spent the last couple of years between India and the US, serving as guest faculty at the Whole Foods Academy, Austin, Bentley University and Babson College, Boston and Esalen, Big Sur. She is also actively involved with supporting the Conscious Capitalism Movement, WIN (Women’s International Network) and is on the board of Peace Through Commerce and MixR. Her client base includes multinational organizations like Tata Consultancy Services, Etsy, Societe Generale Bank, Microsoft, Vodafone and YPO groups. Nilima is currently focused on building the Shakti Fellowship; a 9-month Program developing a global network of conscious leaders and entrepreneurs who collaborate to create peace, prosperity, and beauty through the exchange of multiple forms of capital. In order to navigate the disruptive business scenario and not just survive but thrive, leaders soon realize that they are going to have to make a journey. A journey that requires deep reserves of resilience and inspiring energy. This can only come from tapping into Shakti, the infinite source of power within us that makes us fully present, fuels our creativity and drives change. Not given freely, it has to be earned, by the heroic capacity in us. Shakti-based Leadership, is a coming-of-age quest from one’s untested innocence to masterful maturity. While the ‘heroic journey’ is experienced as deeply personal, the process is completely universal and surprisingly little-known. Using language and ideas that awaken, inspire and move us, individually and together, Nilima will draw from Joseph Campbell and Maureen Murdock’s work around the mythic Hero/ Heroine’s journey and apply it to modern leadership, business and life. Reframed as a ‘call to adventure’, you will see these testing times as an opportunity for exponential transformation. And receive the road-map, discern the milestones, the destination; and uncover its grand empowering ‘elixirs’, for you as well as your company. Why lead with only half of one’s power? The prevailing leadership paradigm overemphasizes masculine values such as confidence, competition and decisiveness, often to the neglect of vulnerability, collaboration and openness; and focuses primarily on an outside-in, competency-based approach. This keynote/workshop aims to awaken both men and women to their innate feminine leadership capacities, through an inside-out, consciousness-based approach, that connects them directly to their authentic, resilient, life-affirming and regenerative core, their Shakti. Using experiential and self-reflective tools such as the Presence Practice and a Leadership Style Assessment, participants will learn how to flex between their masculine and feminine nature, to come into their true power. The core insight of Shakti Leadership are the four primary drives that we are all churned by: Kama - Mara - Maya – Vidya (Or Eros – Thanatos - Mythos – Logos) … and the four powers latent within us that alone can master them. Through the paradox of the wise-fool and tough-love, participants will discover the sweet spot where they can come into their fullness as leaders and flow with freedom and fulfilment. 'Presence' is that state of inner poise where a Conscious Leader is located first, before becoming an effective change-agent. Presence is also the source of Shakti, the true power that fuels all ‘doing’. Participants will learn to access and cultivate this internal state through a profoundly simple Shakti Presence Practice, using the Five signals of Presence, from the foundation of a relaxed body: Even breath, Clear mind, Open heart, Sensitive sonar and Energetic induction. Listen to the short version here. According to Indian wisdom, Creation is essentially the divine inter-play of the five fundamental elements: Earth, Water, Fire, Air and Space. Each element has its unique movement, emotion, quality and nature. Participants are guided to find these elements within themselves and set them free through creative movement based on yoga, music and dance. This brings them into balance and harmony with themselves as well as with their context; it also proves therapeutic and de-stressing on all levels. The learnings from this deceptively simple workshop are deep and long-lasting; participants gain valuable insights that are immediately transferable to their work-life: how to embrace change and turbulence, even as they remain firmly grounded in Presence. As women seek to reclaim their power and step up into leadership roles, they need to get real with their deepest hopes, fears and needs. A methodology that is both traditional and contemporary, the Shakti Circle is a safe and potent space for collective inquiry and group processing. When we can tend with affection and compassion to that which is not being said, and allow it expression without judgment, a new energy is released which heals and transforms individuals as well as the collective, taking us to a whole new level of trust, fellowship, understanding and action. Nilima has facilitated Shakti circles with women from Rome and Delhi to Prague, Berlin and Boston. Each is a unique experience, co-created by the vital voices and energies that participants bring. The power of a circle is immense, and lasting shifts are often experienced. If we have to survive and thrive as a community or company, we need a culture that values different perspectives and creatively leverages them into a high-performing and cohesive whole. The Dialogue Circle is a powerful and safe space that allows for diverse perspectives to be shared and excluded voices to be aired. When facilitated with care, we can speak authentically and listen deeply to some of the burning issues that occupy our hearts and minds, bodies and souls as we get to work each day. Taking us to a whole new level of trust, fellowship, understanding and action. The reconciling power of a circle is immense, and can be the single most powerful intervention to drive rapid shifts in attitude, behavior and culture change. That may be compromising your immunity and health. Most importantly she will share how you can move past stress towards true Well-being. At the end of the workshop you should have a map of your 5 stressors and know how to move from Stress to Swasthya (Total Well Being)! It can be exhausting being a woman holding down work, family, babies, finances, fitness etc. We get caught in all our roles that we forget there is a ‘me’ underneath it all, who we have lost sight of. We get so busy ‘doing’, we forget ‘being’. And why does it have to be an either-or choice? Why can’t we have it all? Success and Health, Fulfillment and Freedom? Join Nilima Bhat, in exploring the wheel of a balanced life that contains all that is important to you. And more importantly, listen to your inner voice and its wisdom to gain clarity around what action you are ready to take to claim the life you deserve. We yearn to make new beginnings, to seize the moment and meet our destiny. To find our purpose, to make a difference. To radiate beauty and poise. Yet, we find ourselves tripping up by sabotaging inner baggage. “I don’t have enough! I am not loved enough! I am not enough!” In this reflective exercise and guided meditation we will learn the use of contemplative sacred geometry and sincere intention to shred our old programs and express our essence. A stress-busting play-shop to Love, Accept, Forgive your way to emotional freedom and health. Come understand the healing power of these themes in the prevention and treatment of disease, especially cancer. Learn innovative meridian therapies and targeted affirmations and experience their multiplied effect when done in a supportive group setting. Psychoneuroimmunology (PNI) establishes the link between stress-immunity-illness and is the science behind mind-body medicine. Cancer has a strong co-relation with unresolved emotional stress around Love, Acceptance, Forgiveness and Letting-go. The purpose of this workshop is to help participants identify their stressful emotional issues and LAF & Let Go them to secure their health. Mind-body medicine tools including EFT (Emotional Freedom Techniques) and Healing Affirmations will be used to release the stressful emotions. Done collectively, the results are further amplified. Subtle shifts and deep healing are known to occur. Participants often resolve chronic stress and achieve a new level of peace and acceptance. The easy to learn techniques in this LAF & Let Go session have lasting therapeutic benefits and will support and enhance all round Wellbeing and Relationships. Our body is not doomed to aging, decay and degenerative conditions like cancer, diabetes, heart disease! Nor is our mind meant to constantly live with the stress of fear, anxiety and emptiness. Learn how to awaken the healing power of our cells to prevent and heal from chronic conditions with Nilima Bhat and to move past stress towards Swasthya, true well being. 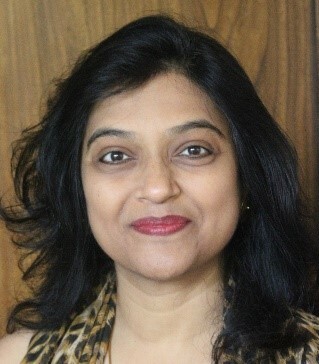 Holistic Health Coach, Nilima Bhat helps people (and groups) seeking personal growth as well as healing through life crises such as illness or relationship breakdown. Drawing from acclaimed coauthored book, ‘My Cancer Is Me’, her approach emphasizes self-understanding on many levels: physical, vital, mental, psychic and spiritual. As a certified yoga teacher, her gift lies in being able to guide individuals to connect with their Soul-truth, and then to live it with authenticity in all aspects of their lives. Her own journey of growth and discovery began with her Mother’s breast cancer in 1980 and was deepened when her husband, Vijay, was diagnosed with colon cancer in 2001. She supplemented her intensive study of Yoga with the therapeutic principles of Chinese medicine, western psychology, creative movement and dance. As their primary care-giver she has successfully navigated cancer with them and now shares their learnings and experience so others may benefit.